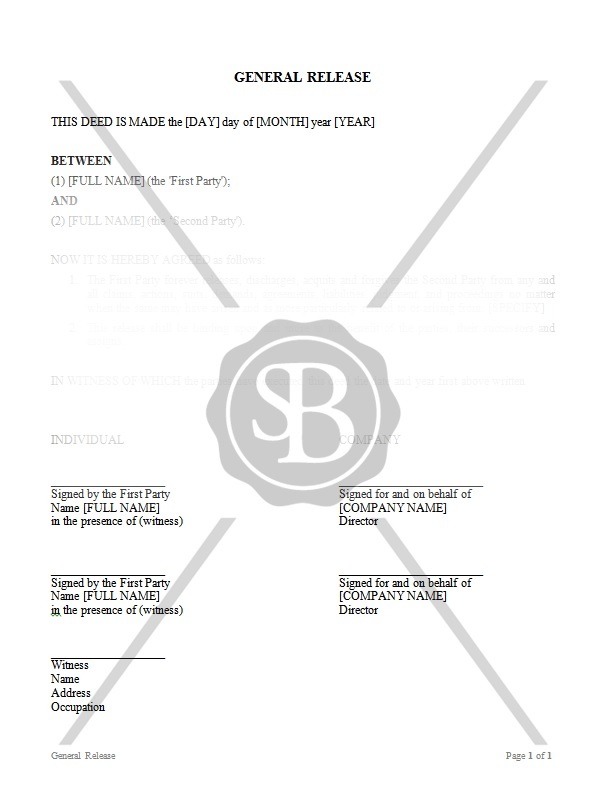 This is an Agreement made between two parties whereby the First party releases the Second party from any existing claims. PLEASE NOTE: The contents of samples of forms and documents are not intended to provide legal, accounting or other professional advice and should not be relied upon as such. These samples provide a general overview of legal information and are aimed for our clients who choose to prepare their own documents. The content of the samples are NOT a substitute for the Advice of an Attorney/Solicitor. It is advised to seek guidance from a professional before using or acting upon sample content to determine its suitability in regards to your circumstances. If you require customization of this document by a legal practitioner or translation of this document into a language other than English, please contact us for further information and a quote.